Any thoughts on what this pair of objects might be? You can put your suggestions in the comments section below and I’ll do my best to respond. Cheers! The ends of a big *u*c*l* ? Maybe from a *w*n ? I don’t know for sure how they are called in English, but they look like the sharp pointy things on the legs of roosters. I will look the proper name up! I thought the same, so I compared them to the spurs on a specimen we have at the museum and they didn’t look at all similar, but checking some of the more extreme versions online I think you may be onto something! Yes. I have had chickens all my life and “un-spurred” some roosters in my time. The spurs then looked like this. Some spurs are really straight but some are curved like these. 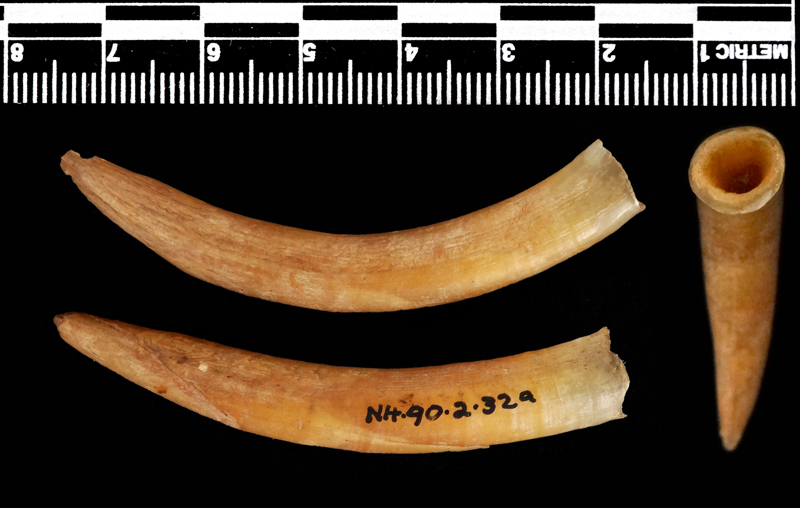 Horns from one of the small antelopes? That’s what they were originally identified as, but I did a lot of comparisons and they don’t really have the same structure. If they were horns the horn core would have been unusually short. That’s what made me doubt the identification in the first place. Look like the toenails of some kind of mammal, perhaps canid, especially with what looks like an interior layer. I did consider that too, but there’s no wear facet on them, which makes it hard to think of a mammal that would fit the bill. How about that most terrifying of modern dinosaurs C*s*****s? One on each foot?